Michael Faraday, FRS (22 September 1791 – 25 August 1867) was an English scientist who contributed to the fields of electromagnetism and electrochemistry. His main discoveries include those of electromagnetic induction, diamagnetism and electrolysis. Faraday was an excellent experimentalist who conveyed his ideas in clear and simple language; his mathematical abilities, however, did not extend as far as trigonometry or any but the simplest algebra. James Clerk Maxwell took the work of Faraday and others, and summarized it in a set of equations that is accepted as the basis of all modern theories of electromagnetic phenomena. On Faraday's uses of the lines of force, Maxwell wrote that they show Faraday "to have been in reality a mathematician of a very high order – one from whom the mathematicians of the future may derive valuable and fertile methods." The SI unit of capacitance, the farad, is named in his honour. Cantor, Geoffrey (1991). Michael Faraday, Sandemanian and Scientist. Macmillian. Hamilton, James (2002). Faraday: The Life. London: Harper Collins. Hirshfeld, Alan W. (2006). The Electric Life of Michael Faraday. ^ a b c Michael Faraday entry at the 1911 Encyclopaedia Britannica hosted by LovetoKnow Retrieved January 2007. ^ a b c d "Archives Biographies: Michael Faraday", The Institution of Engineering and Technology. ^ For a concise account of Faraday’s life including his childhood, see pages 175–83 of EVERY SATURDAY: A JOURNAL OF CHOICE READING, Vol III published at Cambridge in 1873 by Osgood & Co.
^ The implication was that James discovered job opportunities elsewhere through membership of this sect. James joined the London meeting house on 20 February 1791, and moved his family shortly thereafter. See pages 57–8 of Cantor's (1991) Michael Faraday, Sandemanian and Scientist. ^ John H. Lienhard (1992). 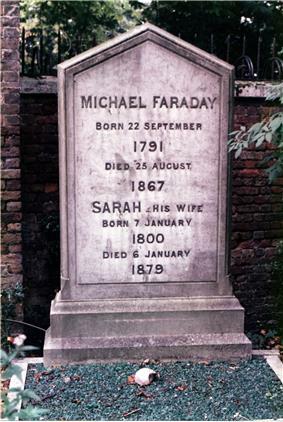 "Michael Faraday". The Engines of Our Ingenuity. Episode 741. No 741: Michael Faraday (transcript). NPR. KUHF-FM Houston. ^ John H. Lienhard (1992). "Jane Marcet's Books". The Engines of Our Ingenuity. Episode 744. No 744: Jane Marcet's Books (transcript). NPR. KUHF-FM Houston. ^ See pages 41–43, 60–4, and 277-80 of Geoffrey Cantor's (1991) Michael Faraday, Sandemanian and Scientist. ^ Mary Ellen Bowden (1997). "Chemical Achievers: The Human Face of the Chemical Sciences". p. 30. ^ Twickenham Museum on Faraday and Faraday House; accessed August 14, 2014. ^ Croddy, Eric; Wirtz, James J. (2005). Weapons of Mass Destruction: An Encyclopedia of Worldwide Policy, Technology, and History. ^ Jensen, William B. (2005). "The Origin of the Bunsen Burner" (PDF). ^ Faraday, Michael (1821). "On two new Compounds of Chlorine and Carbon, and on a new Compound of Iodine, Carbon, and Hydrogen". Philosophical Transactions 111: 47. ^ Faraday, Michael (1823). "On Hydrate of Chlorine". Quartly Journal of Science 15: 71. 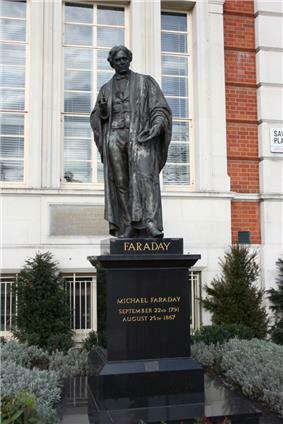 ^ Faraday, Michael (1859). Experimental Researches in Chemistry and Physics. London: Richard Taylor and William Francis. pp. 81–84. ^ Faraday, Michael (1844). Experimental Researches in Electricity 2. See plate 4. ^ Hamilton's A Life of Discovery: Michael Faraday, Giant of the Scientific Revolution (2004) pp. 165–71, 183, 187–90. ^ Cantor's Michael Faraday, Sandemanian and Scientist (1991) pp. 231–3. ^ Thompson (1901) p. 91. This lab entry illustrates Faraday’s quest for the connection between light and electromagnetic phenomenon 10 September 1821. ^ pp. 95–98 of Thompson (1901). 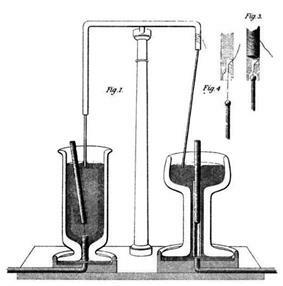 ^ Faraday's initial induction lab work occurred in late November 1825. His work was heavily influenced by the ongoing research of fellow European scientists Ampere, Arago, and Oersted as indicated by his diary entries. Cantor’s Michael Faraday: Sandemanian and Scientist (1991) pp. 235–44. ^ Zeeman, Pieter (1897). "The Effect of Magnetisation on the Nature of Light Emitted by a Substance". ^ a b "Michael Faraday (1791-1867)". The Royal Institution. Retrieved 20 February 2014. 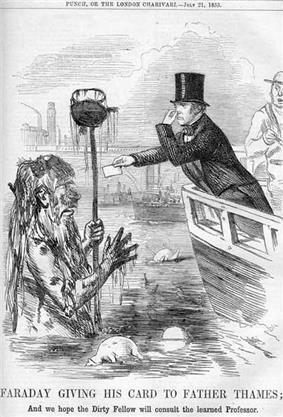 ^ See The Illustrated London News, July 1853, for Faraday's comments. ^ Lan, Boon Leong, and Jeanette B. S. Lim. "Michael Faraday: Prince Of Lecturers In Victorian England." The Physics Teacher (Stony Brook, N.Y.) 39.1 (2001): 32-36. ^ Hirshfeld, Alan. The Electric Life of Michael Faraday. New York: Walker & Company, 2006. Print. ^ Seeger, Raymond J. 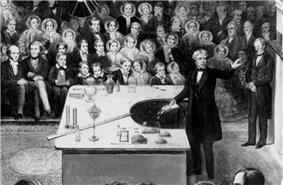 "Michael Faraday and the Art of Lecturing." Physics Today (1968): 30-38. Print. ^ Michael Faraday Primary School. ^ "Withdrawn banknotes reference guide". ^ "100 great Britons – A complete list". Faraday, Michael (1861). W. Crookes, ed. A Course of Six Lectures on the Chemical History of a Candle. Griffin, Bohn & Co.
Faraday's life and contributions to electromagnetics was the principal topic of the tenth episode of the 2014 American science documentary series, Cosmos: A Spacetime Odyssey, which was broadcast on Fox and the National Geographic Channel. Faraday Gardens is a small park in Walworth, London, not far from his birthplace at Newington Butts. This park lies within the local council ward of Faraday in the London Borough of Southwark. Michael Faraday Primary school is situated on the Aylesbury Estate in Walworth. A statue of Faraday stands in Savoy Place, London, outside the Institution of Engineering and Technology. Also in London, the Michael Faraday Memorial, designed by brutalist architect Rodney Gordon and completed in 1961, is at the Elephant & Castle gyratory system, near Faraday's birthplace at Newington Butts. Faraday School is located on Trinity Buoy Wharf where his workshop still stands above the Chain and Buoy Store, next to London's only lighthouse. Michael Faraday delivering a Christmas Lecture at the Royal Institution in 1856. Education was another of Faraday's areas of service; he lectured on the topic in 1854 at the Royal Institution, and in 1862 he appeared before a Public Schools Commission to give his views on education in Great Britain. Faraday also weighed in negatively on the public's fascination with table-turning, mesmerism, and seances, and in so doing chastised both the public and the nation's educational system. Faraday assisted with the planning and judging of exhibits for the Great Exhibition of 1851 in London. He also advised the National Gallery on the cleaning and protection of its art collection, and served on the National Gallery Site Commission in 1857. As a respected scientist in a nation with strong maritime interests, Faraday spent extensive amounts of time on projects such as the construction and operation of light houses and protecting the bottoms of ships from corrosion. His workshop still stands at Trinity Buoy Wharf above the Chain and Buoy Store, next to London's only lighthouse where he carried out the first experiments in electric lighting for lighthouses. Beyond his scientific research into areas such as chemistry, electricity, and magnetism at the Royal Institution, Faraday undertook numerous, and often time-consuming, service projects for private enterprise and the British government. This work included investigations of explosions in coal mines, being an expert witness in court, and along with two engineers from Chance Brothers c.1853, the preparation of high-quality optical glass, which was required by Chance for its lighthouses. In 1846, together with Charles Lyell, he produced a lengthy and detailed report on a serious explosion in the colliery at Haswell County Durham, which killed 95 miners. Their report was a meticulous forensic investigation and indicated that coal dust contributed to the severity of the explosion. The report should have warned coal owners of the hazard of coal dust explosions, but the risk was ignored for over 60 years until the Senghenydd Colliery Disaster of 1913. In his work on static electricity, Faraday's ice pail experiment demonstrated that the charge resided only on the exterior of a charged conductor, and exterior charge had no influence on anything enclosed within a conductor. This is because the exterior charges redistribute such that the interior fields due to them cancel. This shielding effect is used in what is now known as a Faraday cage. Faraday also discovered that the plane of polarization of linearly polarized light can be rotated by the application of an external magnetic field aligned with the direction in which the light is moving. This is now termed the Faraday effect. He wrote in his notebook, "I have at last succeeded in illuminating a magnetic curve or line of force and in magnetising a ray of light". 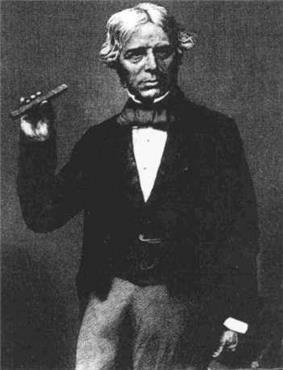 Michael Faraday holding a glass bar of the type he used in 1845 to show that magnetism can affect light in a dielectric material. English chemists Michael Faraday (relative direction) and John Daniell (relative direction), credited as founders of electrochemistry today. In 1821, soon after the Danish physicist and chemist Hans Christian Ørsted discovered the phenomenon of electromagnetism, Davy and British scientist William Hyde Wollaston tried, but failed, to design an electric motor. Faraday, having discussed the problem with the two men, went on to build two devices to produce what he called "electromagnetic rotation". 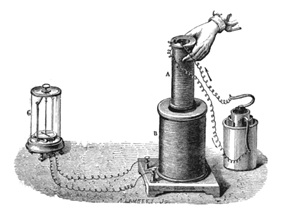 One of these, now known as the homopolar motor, caused a continuous circular motion that was engendered by the circular magnetic force around a wire that extended into a pool of mercury wherein was placed a magnet; the wire would then rotate around the magnet if supplied with current from a chemical battery. 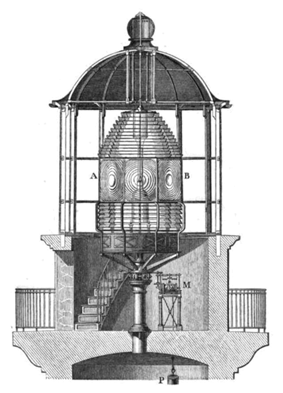 These experiments and inventions formed the foundation of modern electromagnetic technology. 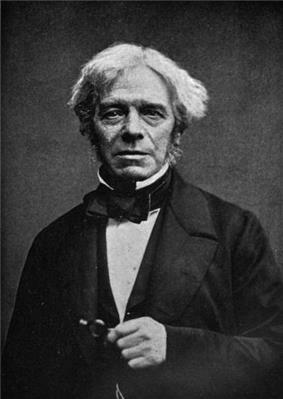 In his excitement, Faraday published results without acknowledging his work with either Wollaston or Davy. 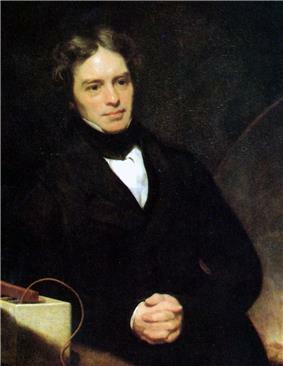 The resulting controversy within the Royal Society strained his mentor relationship with Davy and may well have contributed to Faraday’s assignment to other activities, which consequently prevented his involvement in electromagnetic research for several years. Faraday is best known for his work regarding electricity and magnetism. His first recorded experiment was the construction of a voltaic pile with seven ha'penny coins, stacked together with seven disks of sheet zinc, and six pieces of paper moistened with salt water. With this pile he decomposed sulphate of magnesia (first letter to Abbott, 12 July 1812). Michael Faraday in his laboratory, ca. 1850s. Faraday died at his house at Hampton Court on 25 August 1867, aged 75. He had previously turned down burial in Westminster Abbey, but he has a memorial plaque there, near Isaac Newton's tomb. Faraday was interred in the dissenters' (non-Anglican) section of Highgate Cemetery. Faraday suffered a nervous breakdown in 1839 but eventually returned to his electromagnetic investigations. In 1848, as a result of representations by the Prince Consort, Faraday was awarded a grace and favour house in Hampton Court in Middlesex, free of all expenses or upkeep. This was the Master Mason's House, later called Faraday House, and now No. 37 Hampton Court Road. In 1858 Faraday retired to live there. In June 1832, the University of Oxford granted Faraday a Doctor of Civil Law degree (honorary). 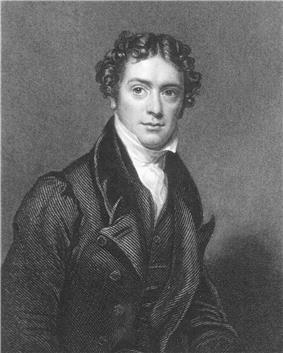 During his lifetime, he was offered a knighthood in recognition for his services to science, which he turned down on religious grounds, believing it was against the word of the Bible to accumulate riches and pursue worldly reward, stating he preferred to remain "plain Mr Faraday to the end". He twice refused to become President of the Royal Society. He was elected a foreign member of the Royal Swedish Academy of Sciences in 1838, and was one of eight foreign members elected to the French Academy of Sciences in 1844. Faraday was a devout Christian; his Sandemanian denomination was an offshoot of the Church of Scotland. Well after his marriage, he served as deacon and for two terms as an elder in the meeting house of his youth. His church was located at Paul's Alley in the Barbican. This meeting house was relocated in 1862 to Barnsbury Grove, Islington; this North London location was where Faraday served the final two years of his second term as elder prior to his resignation from that post. Biographers have noted that "a strong sense of the unity of God and nature pervaded Faraday's life and work." In the class-based English society of the time, Faraday was not considered a gentleman. When Davy set out on a long tour of the continent in 1813–15, his valet did not wish to go. Instead, Faraday went as Davy's scientific assistant, and was asked to act as Davy's valet until a replacement could be found in Paris. Faraday was forced to fill the role of valet as well as assistant throughout the trip. Davy's wife, Jane Apreece, refused to treat Faraday as an equal (making him travel outside the coach, eat with the servants, etc. ), and made Faraday so miserable that he contemplated returning to England alone and giving up science altogether. The trip did, however, give him access to the scientific elite of Europe and exposed him to a host of stimulating ideas. In 1812, at the age of twenty, and at the end of his apprenticeship, Faraday attended lectures by the eminent English chemist Humphry Davy of the Royal Institution and Royal Society, and John Tatum, founder of the City Philosophical Society. Many of the tickets for these lectures were given to Faraday by William Dance, who was one of the founders of the Royal Philharmonic Society. Faraday subsequently sent Davy a three-hundred-page book based on notes that he had taken during these lectures. Davy's reply was immediate, kind, and favourable. When Davy damaged his eyesight in an accident with nitrogen trichloride, he decided to employ Faraday as a secretary. When one of the Royal Institution's assistants, John Payne, was sacked, Sir Humphry Davy was asked to find a replacement, and appointed Faraday as Chemical Assistant at the Royal Institution on 1 March 1813.